Emerging technologies and new platforms have made social media advertising a very important part of the marketing mix. While some companies have found success with social media, others are struggling to find new ways to engage their audience, attract new customers, and convert individuals to brand loyalists. They are simply failing when it comes to effectively using social media advertising. Here are some prime examples of what not to do with your social media advertising. Fear not if you have made some of these mistakes in the past — just learn from them and move on. One reason that social media advertising is so powerful is because the platforms have impressive targeting capabilities. In order to create effective ads that target the right audiences, you’ll need to conduct an audience analysis deep dive. Getting to know your target audience will take some time. What are they into? What do they care about? What are their concerns and problems? How old are they? Where do they live? Conducting thorough audience research will ensure your social media marketing efforts are as effective and targeted as they can be. Many businesses that fail to do this will either cast too wide or too narrow of a net. Sure, your audience may range from age 20 to 60, however, they may have varying concerns or needs. Breaking these audiences off into smaller groups, and developing messages that speak directly to them, will increase your conversion and engagement rates. On the flip side, it’s important to make sure that your audience is not too small. If you are targeting a tiny audience, it will be difficult to gather good insights. You can easily fix this by spreading out your advertising dollars and A/B testing ad sets against one another. You may think it’s a good idea to spread your social media advertising efforts across multiple platforms, however, this can actually hinder your efforts. If you haven’t done your audience analysis deep dive, you probably don’t know which social platforms are best for finding and engaging your target audience. As a result, you can end up spreading your efforts too thin. Not only is this time consuming and expensive, it’s inefficient because it prevents you from focusing your efforts on the right platforms for your brand. There are multiple options for social media advertising out there, however, choosing one or a few platforms to really focus in on will usually give you the best bang for your buck. 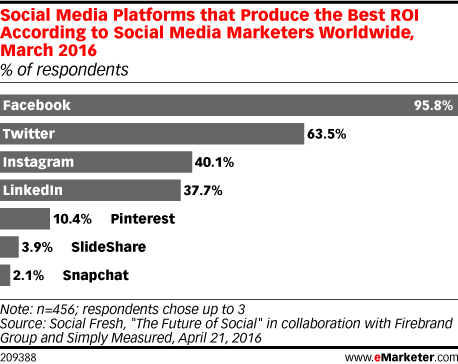 In terms of ROI, more than 95 percent of social media managers say Facebook offers the best return, followed by Twitter and Instagram, while only 2.1% of managers thought that Snapchat produced the best ROI. With so many choices, it can be a challenge to develop a social media advertising strategy that works for your unique business. Although Facebook boasts the largest audience, it may not be the most effective channel for your message. For example, if you are targeting American teens, Instagram may be a better choice. If your brand is highly visual, Facebook, Instagram, and Pinterest may be great options. On the other hand, if you offer professional services or products, LinkedIn and Twitter will likely yield the best results. Figuring out your audience is the first step, then you can research which platform is best for delivering your message to that audience. In some advertising campaigns, repetition can be key, however, when engagement is an important factor, fresh content will win the hearts of your audience. An overly repetitive campaign will hinder and frustrate social media users. Keeping things fresh will garner more likes, comments, and shares across your social media platforms. For some companies, keeping things fresh means changing ads every 3 to 5 days, while other businesses may find success by changing out ads every season or every quarter. As you can see, switching up your ads is really a delicate balance. It will take trial and error to find what works best for your product or service. Keep a close eye on important stats like engagement and conversion to see which ads are performing. If you notice a dip in conversions, or your ads are simply not performing like they used to, it may be time to switch things up. You may have been fooled by clickbait headlines in the past. You see an attention grabbing headline, with a powerful image, and click to read more, only to be prompted with a form to fill out your information. What’s your first thought? To fill out the form? Or do you quickly abandon the page? If you run a poorly executed clickbait campaign, your audience will leave, too. 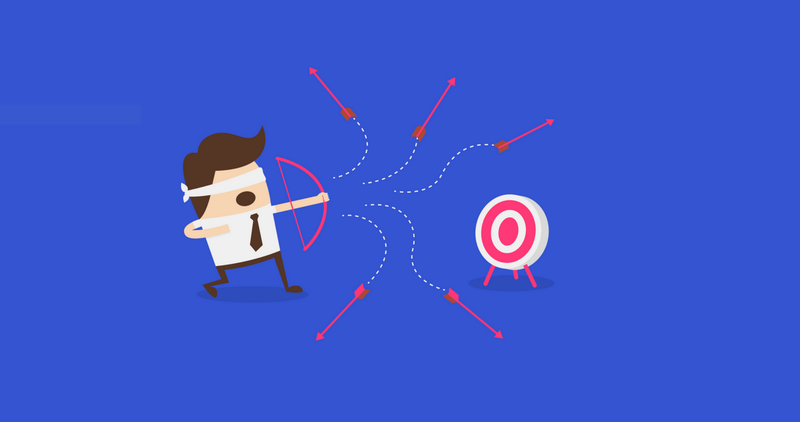 Clickbait is not only frustrating for the user, but it won’t win you over any quality customers. While you will gain a lot of curiosity clicks, you really don’t want that to be the only thing you have going for your website. As a result, you’ll receive thousands of clicks to your website, but have very low time-on-site and high bounce rates. 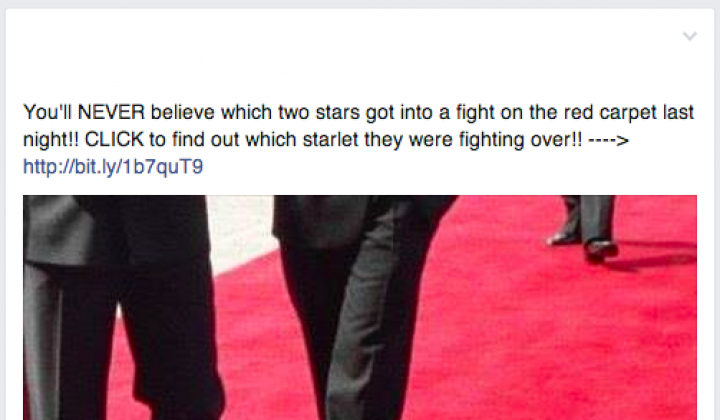 A few years ago, clickbait was a huge problem in social media. As a result, Facebook now penalizes it. Facebook determines if an article is clickbait by looking at how long people spend reading the article away from Facebook. If people click on an article and read it, this suggests that the content is of value. If they click through and come right back, it suggests they didn’t find something they wanted. 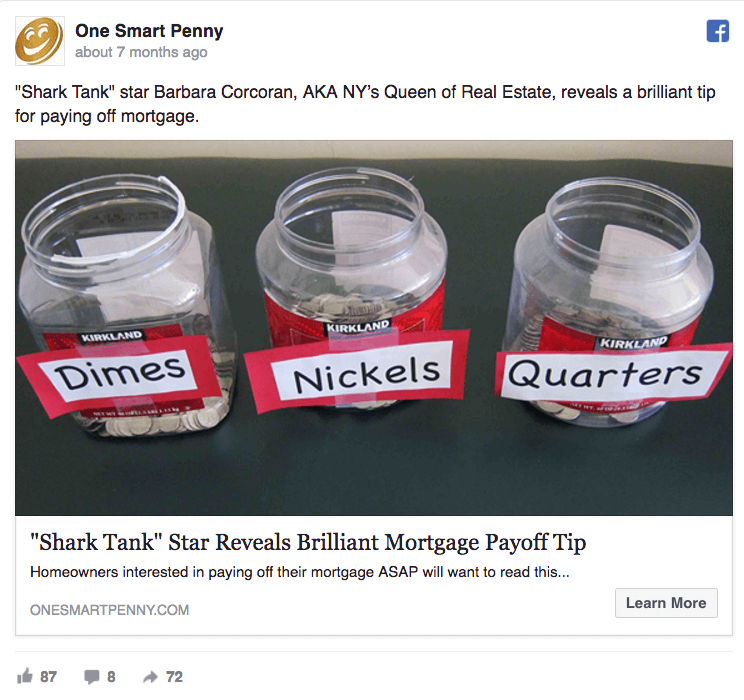 One Smart Penny has decided to piggyback off the hit TV show “Shark Tank” to successfully grab their audience’s attention. However, the reason this clickbait headline works is because once you get to the landing page, they follow through with helpful tips and tricks to pay off a mortgage. Delivering on what the ad mentions makes all of the difference in this case. When creating a social media advertising campaign, you might think it’s obvious what you want the user to do, but it may not be. Tell your audience what to do by using a call-to-action button on Twitter, Facebook, and Instagram. For example, if you want someone to sign up for your free newsletter, include a “sign up” call to action button. Are they buying something? Include a “shop now” button. Do you want them to seek more information? Use the “learn more” button. Always make it clear what the next step is and what you want your audience to do. 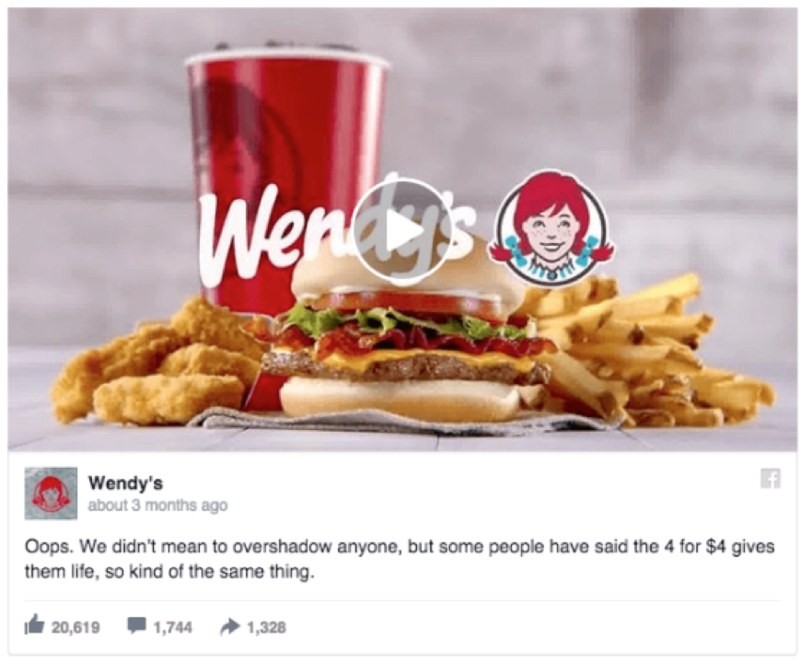 Aside from having a poor headline, this Wendy’s Facebook ad does not include a call-to-action. At the very least, the ad should encourage fans to leave a comment or visit your closest Wendy’s today. Arguably more important than the social ad is the landing page where you take your audience. One of the biggest mistakes companies make is having one lead generating landing page they send all of their paid traffic to. Even worse, some companies just send their traffic to the homepage. This is a mistake. Instead, you’ll want to tailor the message on your landing page to speak directly to the advertisement. Plus, you’ll want to give it the same look and feel to give users the same experience. For example, if you want people to sign up for your newsletter, use the ad to take them to a landing page with a bold form. Don’t send them to the homepage to have them search around for the form. Make it easy and simple for them to sign up. If you want people to read reviews about your product, make the landing page review focused. Want them to shop for a new product? Take them to a landing page that specifically speaks about the benefits of the new product. 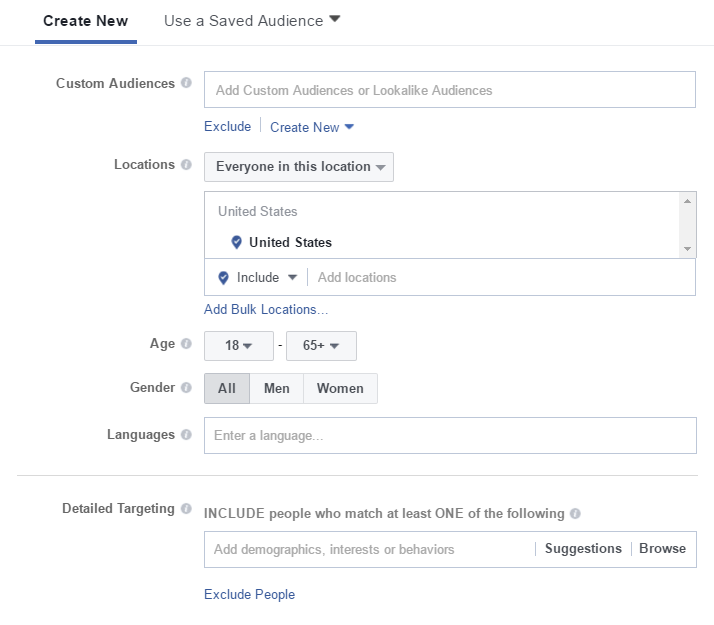 Not only is this best practice for social advertising, but it allows you to create custom audiences based on what people are clicking through to. This will allow you to remarket to them further down the funnel. By now you should realize that monitoring your social ads for clicks, conversions, and engagement is important, but don’t forget to also monitor your ads for comments. Social listening, and having a real person respond to comments, is key to social media advertising success. In fact, when companies engage and respond to customer service requests over social media, those customers end up spending 20% to 40% more with the company, according to Bain & Company. On the opposite end of the spectrum, poor social customer service can have negative consequences. In fact, 66% of customers have stopped doing business with a company due to bad customer service experiences. Unfortunately, many companies use social media to blast out promotions, but don’t take the time to respond to feedback. The great thing about social media is that your customers and prospects can ask questions, join the conversation, and get to learn more about your products, services, and brands. Not responding in a timely manner will frustrate consumers and turn them away. Research indicated that 42% of consumers expect a response from a brand on social media within 60 minutes of their inquiry. Your social advertisements will likely garner a lot of visibility, so you must create a strategy to respond to consumers. Some people will have awesome things to say about your company, while others may have some negative things to say. It’s important to not ignore those that are disgruntled. If a customer has had a negative experience with your brand, listen to their concerns, respond with a personalized approach, and escalate their issue further. You may want to analyze this feedback to gain valuable insights about your audience and understand the drivers of your customers’ conversations. 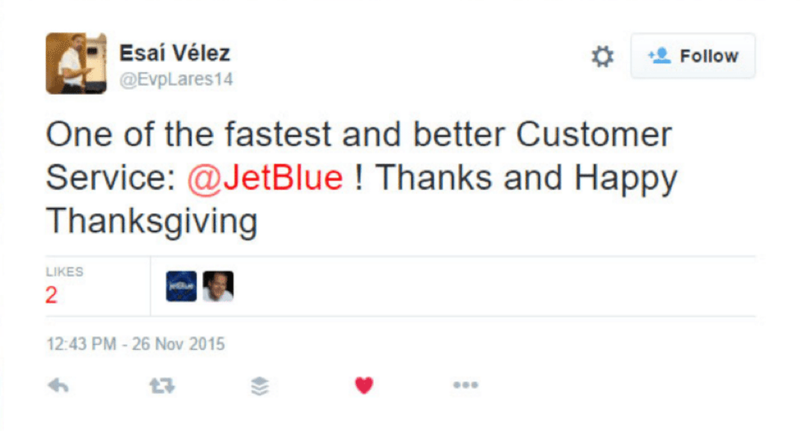 Take JetBlue for example. 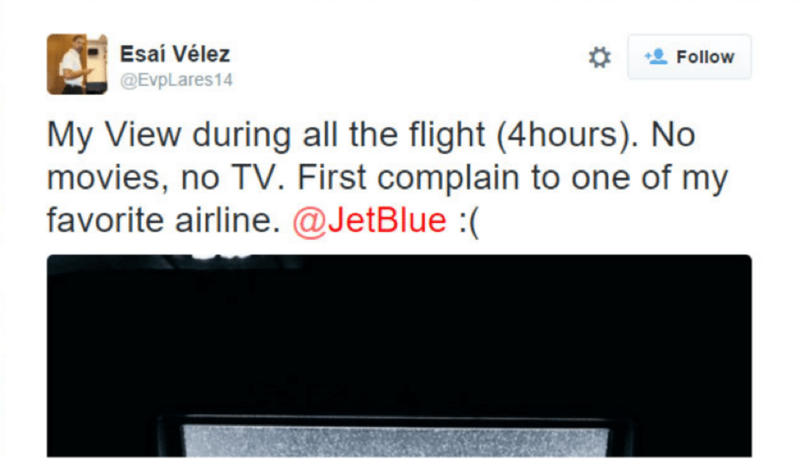 One passenger tweeted the airline complaining of their view on the flight. By resolving the passenger’s issue, the company was not only able to increase customer satisfaction, the public response garnered a lot of positive brand attention, too. If you are running an influencer marketing campaign and want to promote products or services on social media, you will also need to disclose those endorsements to the US Federal Trade Commission. Lord and Taylor learned this the hard way in the spring of 2015. 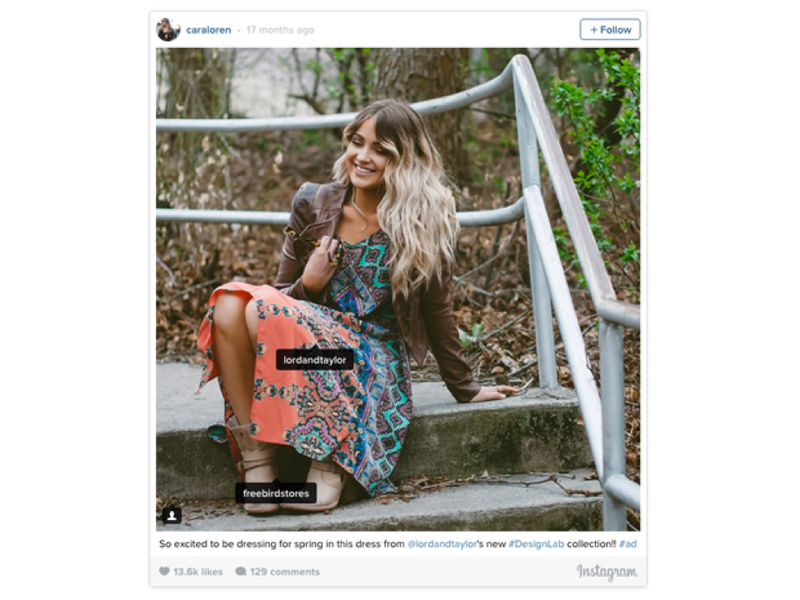 The store ran an Instagram influencer campaign to promote a fashion line. Posts received more than 5,000 likes and a number of clothing items sold out quickly. However, the influencers didn’t disclose that they were paid for the ads. This is a violation of FTC guidelines. Later, some posts were edited to include #ad in the caption. Avoid running into any legal problems by contacting the FTC if you decide to run a social media influencer campaign. When done correctly, social media advertising can be affordable, scalable and extremely effective for your brand. Although it can be hard to keep up with the most popular platforms, strategies, and best advertising practices for your company, having Mod Girl consultants on your side will help. Contact us to discuss your social media advertising strategy, how you can grow your social media presence, and convert more users into lifelong customers.